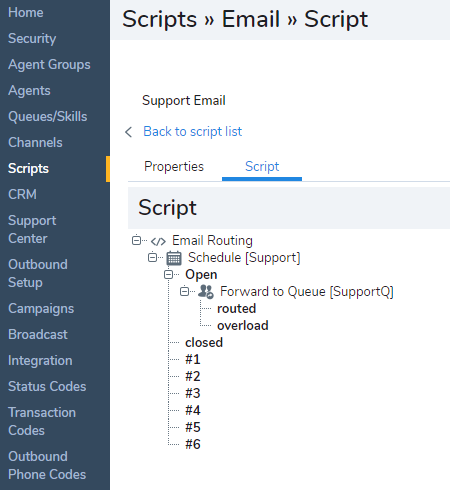 Use the Scripts tab to create or edit an email script used to route incoming email interactions to the correct email queue. Copy script from Choose this option to place a copy of the default or an existing IVR script into this channel. Click Email Routing. The [ add] link appears. To design Phone and Chat scripts select Phone or Chat and then follow steps 3 to 7. Note: When creating or modifying an email script, in the email channel's Properties tab, clear This script is enabled. This ensures that Virtual Contact Center does not run an incomplete email script. After completing the script, re-enable the email script.